The history of the Gulf War has a multitude of components - including internal decisionmaking as well as diplomatic, economic, and conventional military activities. This briefing book primarily focuses on the intelligence, space operations, and Scud-hunting aspects of the war. It also includes a report describing how Desert Storm affected China's view of future warfare, a document that raises questions as to what lessons other nations have drawn from U.S. military engagements in the Middle East and the Balkans. Document 1: Defense Intelligence Agency, Scud B Study, August 1974. Secret, 18 pp. Document 2: George Bush, National Security Directive 45, U.S. Policy in Response to the Iraqi Invasion of Kuwait, August 20, 1990. Secret, 5 pp. This NSD was the first of two key Presidential directives that guided U.S. policy and actions in response to Saddam Hussein's invasion of Kuwait. The directive articulated U.S. interests in the region and the four principles that would guide U.S. policy during the crisis--including the "immediate, complete, and unconditional withdrawal of all Iraqi forces from Kuwait" and "a commitment to the security and stability of the Persian Gulf." The directive went on to specify diplomatic, economic, energy, and military measures the U.S. would take to achieve its objectives. Document 3: DIA Iraq Regional Intelligence Task Force, Iraq Launches Multiple SRBM's Dec 2, December 3, 1990. Secret/Noforn, 1 p.
Document 4: George Bush, National Security Directive 54, Responding to Iraqi Aggression in the Gulf, January 15, 1991. Top Secret, 3 pp. This National Security Directive provided the authorization for U.S. forces to begin military action, authorized by various U.N. resolutions, to expel Iraqi forces from Kuwait. The directive notes that while the economic sanctions imposed on Iraq "have had measurable impact upon Iraq's economy but have not accomplished the intended objective of ending Iraq's occupation of Kuwait. There is no persuasive evidence that they will do so in a timely manner." The directive goes on to specify the objectives of military action (identical to the ones in NSD 45) and the means of accomplishing those objectives. In addition, the directive states that the United States would not support efforts to change the boundaries of Iraq, but delineates Iraqi actions (including an attempt to destroy Kuwait's oil fields) that would lead the U.S. to seek to "replace the current leadership of Iraq." Despite Iraq's setting fire to Kuwaiti oil wells, the United States decided not to try to replace the regime of Saddam Hussein. Document 5: John F. Stewart Jr., Operation Desert Storm, The Military Intelligence Story: A View from the G-2 3d U.S. Army, April 1991. Unclassified, 44 pp. This memoir, written by the Army's chief intelligence officer in the Persian Gulf theater of war, provides an overview of a number of aspects of Army and military intelligence activity during the Persian Gulf war. Stewart examines management and operational challenges, support to campaign planning, and key lessons learned. Management challenges included finite capabilities of collection systems, competing requirements, and dissemination while operational challenges included targeting, battle damage assessment, a scarcity of Arabic linguists, and the need for updated maps. Lessons learned included the need for the Army "to develop an imagery architecture to provide near-real time photography to commanders from Corps through Brigade" as well as to emphasize the requirement for a "wide area, high resolution imagery capability." Document 6: United States Central Command, Operation Desert Shield/Desert Storm, 11 July 1991. Executive Summary. Top Secret, 31 pp. This executive summary of the Central Command's assessment of operations Desert Shield and Desert Storm "focuses on events leading to the execution of combat operations and key assessments made during the crisis." It includes both a chronological account of events (Part I) as well as an assessment of functional areas (Part II). Thus, Part I examines pre-conflict events, Iraq's invasion of Kuwait, the creation of the allied coalition, Desert Shield, and Desert Storm. Part II explores operations and training, plans and policy, intelligence, communications, security assistance, logistics, force structure, personnel issues, legal issues, and public affairs activities. Beyond recounting developments in these areas it notes shortfalls and lessons learned. Document 7: Air Force Space Command, Desert Storm "Hot Wash" 12-13 Jul 1991, July 1991. Secret, 10 pp. This 9-page assessment examines space operations during Desert Storm with respect to nine different areas, including weather support, satellite communications (SATCOM), navigation, use of multi-spectral imagery, tactical ballistic missile warning, and satellite repositioning. Each page focuses on one area, and includes observations, discussion, lessons learned, and recommended actions. The assessment notes, inter alia, that satellite communications were indispensable but SATCOM radios/channels were stressed by a "flood of communications," that the Global Positioning System (GPS) provided navigation updates to virtually every weapon system in the theater, the need for wide area multi-spectral imagery, and that Defense Support Program satellites, originally designed to detect strategic ballistic missiles, were effective in detecting Scud launches. Document 8: Defense Intelligence Agency, Defense Intelligence Assessment, Mobile Short-Range Ballistic Missile Targeting in Operation DESERT STORM, November 1991. Secret, 13 pp. During the Persian Gulf War Iraq fired 88 Iraqi-modified Scuds at Israel, Saudi Arabia, and Bahrain. The Scud attacks on Israel threatened to provoke Israel into a counterattack, which the U.S. wished to avoid for fear that it would shatter the Allied coalition. From the beginning of the war destruction of Iraqi Scuds represented a high priority for U.S. and allied forces--which involved the use of space systems, aerial platforms, and special operations forces. Destruction of Iraq's mobile Scud forces proved far more difficult than expected, in part due to Iraqi tactics. At war's end there had been no confirmed kills of mobile Scuds. This post-war DIA assessment focuses on a number of subjects, including pre-war intelligence assumptions, Iraqi Scud deployment and dispersal, the capabilities of Iraq's extended range Scuds, and means of measuring the effectiveness of the counter-Scud effort. It concluded that the "lessons learned during Operation DESERT STORM can provide the framework for developing a more effective, realistic approach to targeting both Third World ballistic missiles and Soviet mobile intercontinental ballistic missiles in the future." Document 9: Office of History, HQ 37th Fighter Wing, Twelfth Air Force, Tactical Air Command, Nighthawks Over Iraq: A Chronology of the F-117A Stealth Fighter in Operations Desert Shield and Desert Storm, January 1992. Unclassified, 37 pp. Document 10: United States Space Command, United States Space Command Operations Desert Shield and Desert Storm, January 1992. Secret/Noforn, 109 pp. This assessment examines the operations and impact of those space operations conducted by the U.S. Space Command and its components just prior to and during the Persian Gulf war. It thus excludes the classified imagery, signals intelligence, and measurement and signature intelligence satellite operations conducted by the CIA and National Reconnaissance Office. It does focus on the use of the Defense Support Program (launch detection), Global Positioning System (navigation), Defense Meteorological Satellite Program (weather) satellites as well as the operations of U.S. communications and LANDSAT (multispectral imagery) satellites. The document provides a timeline, a narrative of the sequence of events, an assessment of the contribution of each system discussed, and recommendations for future action. Document 11: Coy F. Cross II, 9th RW, The Dragon Lady Meets the Challenge: The U-2 in Desert Storm, n.d. Unclassified. (circa 1992), Chapters 6 and 7, 29 pp. The U-2 program began operations in 1956 with flights over Eastern Europe and the Soviet Union. Overflights of the Soviet Union ended with the shootdown of Francis Gary Powers on May 1, 1960. But the program continued, and involved both peripheral reconnaissance missions as well as overflights of some nations, including China and Cuba. In Operation Desert Storm, the U-2 overflights of Iraq provided a large quantity of imagery. These two chapters of the monograph, written by the 9th Reconnaissance Wing's historian, provide an overview and assessment of U-2 operations in Desert Storm. Document 12: Office of the Deputy Chief of Staff for Intelligence, Annual Historical Review, 1 October 1990 to 30 September 1991, 1993. pp.4-10 to 4-13. Secret, 5 pp. Prior to the full establishment of the Defense HUMINT Service in 1995, each of the military services conducted human intelligence collection efforts in support of their departments. For years the most significant military service HUMINT effort, including both clandestine and overt HUMINT, was conducted by the U.S. Army. This portion of the 1991 fiscal year history for the Army's chief intelligence officer, summarizes some of the contributions of Army overt HUMINT operations, including those related to Desert Storm. According to the history, the collection of information from Iraqi émigrés and defectors provided valuable information with regard to the targeting of Iraqi military facilities as well as avoidance of the inadvertent targeting of certain non-military facilities. Document 13: Defense Intelligence Agency, Intelligence Information Report, PLA Modernizes Its Military Training Program, June 23, 1995. Unclassified, 13 pp. The overwhelming and speedy victory of the U.S.-led coalition, along with the minimal casualties suffered, in the Persian Gulf war caught the attention of the military leadership of a number of countries. Among the components of the allied victory noted by foreign military leaders was the reliance on high-tech weaponry. This Defense Department intelligence report examines changes in the military training program of the PRC People's Liberation Army. Subjects addressed include leadership views and guidance, night operations, and the role of air superiority and air defense. Document 14: Brian G. Shellum, DIA, Defense Intelligence Crisis Response Procedures and the Gulf War, 1996. Unclassified, 19 pp. The essay by the DIA's deputy historian, examines the agency's role in providing intelligence support during operations Desert Shield and Desert Storm. The essay also examines the evolution of DIA activities in support of crisis operations--from the early 1970s to the late 1980s--and the impact of the Goldwater-Nichols military reform legislation. Among the 1980s developments reviewed particular to DIA activities during the Persian Gulf war were the creation of National Military Intelligence Support Teams (NMISTs). The portion of the paper concerning the Gulf War focuses largely on the creation, operations, and, in some cases, theater deployment of elements to provide intelligence support to decision-makers and combatant commanders. These elements included the Iraqi Regional Intelligence Task Force, the Operational Intelligence Crisis Center, and the Department of Defense Joint Intelligence Center. Document 15: DCI Persian Gulf War Illnesses Task Force, Khamisiyah: A Historical Perspective on Related Intelligence, April 9, 1997. Unclassified, 24 pp. As a result of suggestions and allegations that the explanation for the illnesses of many Persian Gulf war veterans was to be found in examining events that took place in the theater during the war, President Clinton established an advisory committee on Gulf War Veterans' Illnesses. To provide intelligence support, Director of Central Intelligence George Tenet established the Persian Gulf War Illnesses Task Force. 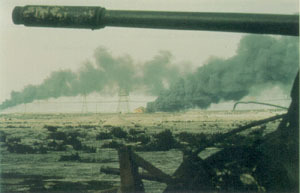 One of its activities was to provide intelligence related to the concern that release of Iraqi chemical agents, possibly as result of the bombing of Iraqi chemical weapons storage sites, particularly Khamisiyah, might have exposed some members of the U.S. armed forces to the chemicals. This task force analysis provides an unclassified analysis of the Iraqi chemical warfare program, and discussion of pre-war intelligence on the Khamisiyah depot (including overhead imagery). Several sections of the study examine, to a limited extent, the tasking, collection, analysis, and dissemination of intelligence concerning the possible presence of chemical weapons at Khamisiyah from the beginning of Desert Shield to 1997. It concludes with a discussion of some lessons learned. Document 16: Defense Intelligence Agency, A Chronology of Defense Intelligence in the Gulf War: A Research Aid for Analysts, July 1997. Unclassified, 56 pp. This chronology, which begins in 1984 and concludes in August 1991, describes events related to DIA-conducted and directed activities relevant to the Persian Gulf War. The chronology includes information on the creation and/or deployment of units subordinate to DIA to provide intelligence support to officials in Washington and in the theater of operations. In addition, it contains some details on tasking of collection assets, collection operations, the production of intelligence, and its dissemination. 1. U.S. News and World Report, Triumph Without Victory: The Unreported History of the Persian Gulf War (New York: Times Books, 1992), pp. 7-9. 2. Richard Hallion, Storm over Iraq: Air Power and the Gulf War (Washington, D.C.: Smithsonian Institution, 1992), p. 159; Rick Atkinson, Crusade: The Untold Story of the Persian Gulf War (Boston: Houghton-Mifflin, 1993), p. 511. 3. A Department of Defense information paper on Iraq's Scud Ballistic Missiles can be found at <www.gulflink.osd.mil/scud_info>. 4. Robert C. Toth, "Iraqi Missile Test Had U.S. Thinking War Started," Los Angeles Times, December 21, 1990, pp. A1, A10. 5. General Accounting Office, "Operation Desert Storm: Evaluation of the Air Campaign," GAO/NSIA-97-134, June 1997.